The picture below is of F/O Handley and crew. However a discrepancy in the records has been noted for this 7th May 1945 sortie. According to the 550 Sqdn ORB Sgt. Firth was flying as MU/AG and Sgt. Hiskins as R/AG: in other words the standard Handley crew. But according to the Station Narrative it was Sgt. Evans, and not Sgt. Firth, who was flying as R/AG. On the balance of probabilities, one would have to believe the Station Narrative in preference. The ORB was probably/possibly typed up by someone in admin on "auto-pilot": on the basis of "oh this is the usual Handley crew list", whereas a debrief, one would have thought, should (must?) be more likely to be accurate. The second name in the list, Sgt. E Evans, is unlikely because he does not arrive in 550 Sqdn until June 1945, thus after the sortie in question. The first, Sgt. G Evans, is probable. 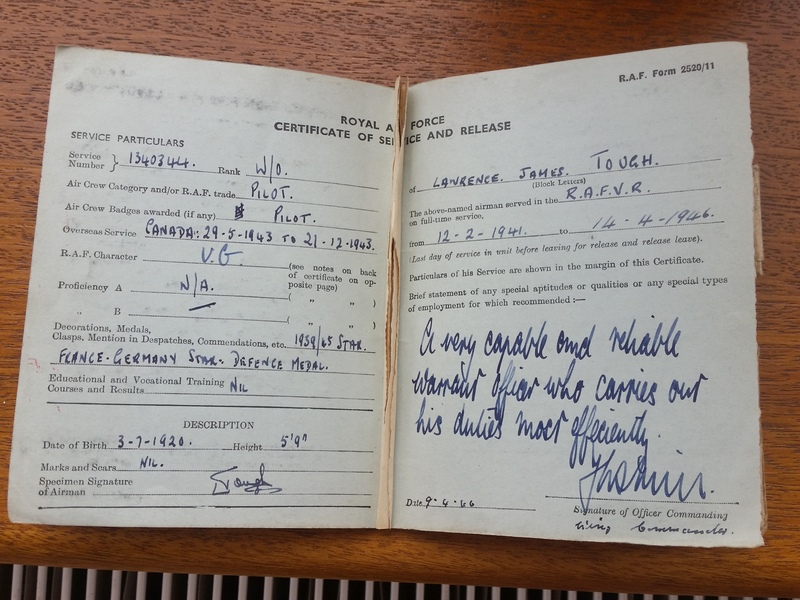 Gwilym Evans was also at this point a "spare bod", in that he was the only survivor of the P/O S W Nielson crew who were lost when ME503 failed to return from operations to Dessau, 7/8 March 1945. On this operation Sgt Charles A DeLaveleye (a Belgian national) was standing in for Sgt Gwilym Evans and was killed as were four others of the P/O Nielson crew (two became PoWs). 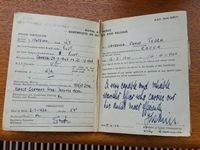 Thanks to David Tough, son of F/Sgt (W/O) Tough, for the following information and this page from the log book. 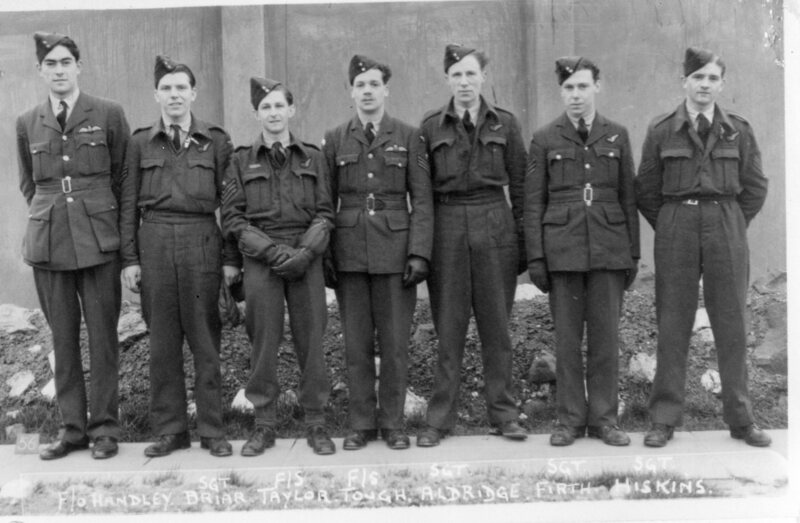 F/Sgt (W/O) Tough trained as a pilot initially in the UK then at Swift Current, Saskatchewan in 1943, then 11 and 16 EFTS, then at 1661HCU, before joining 550 Squadron 27 Feb 1945 to 30 Oct 1945. He qualified as a Flight Engineer in Nov 1944 at RAF St Athan and it seems that this is the role he operated in and as Second Pilot at 550 Squadron. His first active mission was Misburg 15th March and subsequent ops to Nuremberg, Hanau, Bremen, Hildesheim, Langendreep, Paderborn, Hamburg, Nordhausen Barracks, Lutzkendorf, Kiel, Plauen and Bremen. He also participated in Operations Manna and Exodus. He was discharged with the rank of W/O.